Mediathread is CCNMTL's innovative, open-source platform for exploration, analysis, and organization of web-based multimedia content. Mediathread connects to a variety of image and video collections (such as YouTube, Flickr, library databases, and course libraries), enabling users to lift items out of these collections and into an analysis environment. In Mediathread, items can then be clipped, annotated, organized, and embedded into essays and other written analysis. To get started with Mediathread in your course, send an email to ccnmtl-mediathread@columbia.edu. In many ways, the digital landscape offers instructors and students an embarrassment of riches. Columbia University Libraries now spends more of its acquisition budget on electronic databases and journals than on books; the open web teems with information and resources at all ranges of quality; personal collections are being shared like never before. But these riches can actually impoverish scholarship if they cannot be corralled with ease into analysis. Serious study of multimedia objects is often particularly difficult. Here the focus, specificity, and proof that we have come to expect in text-based work can be thwarted by the very real difficulties of interweaving source material and analysis. In fact we may be tempted to look back nostalgically on the relative ease of selecting and recontextualizing pertinent pieces of text within critical discourse, faced with the logistical challenges of invoking source materials across a range of formats, hosted in a variety of places -- places that often have divergent rules and permissions. CCNMTL has long been addressing this challenge with platforms that allow instructors and students in a class to collect media objects, annotate and clip them, queue up selections of this work, and incoporate these selections into multimedia essays. Video Interactions for Teaching and Learning, in particular, has made streaming video available for targeted, sophisticated analysis in schools and departments across Columbia for several years now. Mediathread, an innovative new platform launched by CCNMTL in Fall 2010, now joins VITAL as another significant advance in multimedia annotation, editing, organization, and collaboration. Users of Mediathread are able to easily pluck items out from a range of digital libraries and then work with these items in a course-based analysis environments. Libraries compatible with Mediathread include custom collections assembled for a course, high quality mulitmedia databases licensed by Columbia University Libraries, and publicly available collections such as YouTube, Flickr, OpenVault, and Wikimedia Commons. Since Mediathread is compatible with image as well as video objects, it liberates analysis from the constraints of any one collection or format. Instructors are able to queue up digital collections that are pertinent to a given course, ask students to explore these collections, and select items to analyze with a click of a button -- a click of a bookmarklet, actually. The Mediathread bookmarklet is easily added to any web browser with a quick drag-and-drop. Whenever a student then clicks this bookmarklet, an item from a compatible library is imported into a course-associated Mediathread site, where it can then be tagged, annotated, clipped, and embedded into projects and discussion threads. Mediathread especially supports collaborative work within a class. Groups of students can build essays and other types of projects together, incorporating items that they have collected. Members of a class can see what other members have imported, clipped, and annotated from libraries; students can even incorporate annotations made by others into discussions and projects. Cross-class tagging helps students discover common themes and interests: peer-to-peer discovery centered on items being analyzed. In fact, Mediathread alerts a student whenever an item she has analyzed is also being analyzed by a classmate, or cited in a class discussion. A course on Tibetan Material Culture running on Mediathread is now able to combine extremely granular annotation of Tibetan object images with a sequential, analytic framework -- a framework that includes direct comparison with other objects as well as videos of objects being used in ritual and daily life. A seminar on the History of Epidemiology at the School of Public Health is asking students to harvest representations of epidemiological events from a range of public websites, and connect these images and video to scientific literature in order to deepen historical understanding of these human traumas. 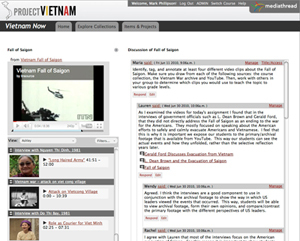 A course on social studies pedagogy in Teachers College is using Mediathread to engage young teachers in building sophisticated multimedia lesson plans, lessons that draw on a range of interviews, news footage, and fictional portrayals of the Vietnam War. CCNMTL is eager to work with librarian partners to connect even more high-quality collections to Mediathread, and to work with faculty to define model uses of its powerful features. A Mediathread site can be quickly set up for any class at Columbia. To discuss ways in which this platform can help your students make targeted use of multimedia source material, please send an email to ccnmtl-mediathread@columbia.edu or stop by the Faculty Support Lab in 204 Butler Library.